Lochend boxer Aston Brown begins his journey to next summer’s Olympics in Rio 6500 miles away at the Acco International Exhibition Centre in Kiev tomorrow night. The 23-year-old flew out to Ukraine on Tuesday evening to prepare for matchday two in this year’s World Series of Boxing (WSB) tournament with the Glasgow-born star lining up for the British Lionhearts franchise against hosts Ukraine Otamans. The Lionhearts, who took a break from the competition last year, have returned to the fold 12 months on and kicked-off this year’s campaign with a narrow 3-2 victory over China Dragons at London’s York Hall last Thursday night. However, tomorrow night is light heavyweight Brown’s opportunity to excel on the big stage, his enthusiasm enhanced further by the recent declaration from the International Boxing Association (AIBA) that qualifying berths for Rio through WSB have increased. A tournament that is often credited as the ‘Champions League’ of amateur boxing, the Lionhearts have been drawn in Group A and will need to finish in one of the top two positions to qualify for the semi-finals. But Brown, a GB Podium boxer who trains four-times a week at the English Institute of Sport in Sheffield, has already had a taste for the event having fought for the Lionhearts two years ago. However, he now duly accepts there is a lot more riding on his bouts this time round. “As soon as I get in the ring tomorrow, my bid to qualify for the Olympics begins,” Brown admitted. “It’s going to give me more experience and confidence of getting that spot for Rio. Being ranked at No.1 at my weight, it’s mine to lose to be honest. I’m going to put everything into it because the Olympics are everything. “But I loved the WSB experience in 2013. It’s something different and a bit more up my street, so it was a no-brainer when the Lionhearts approached me again. “I wasn’t there in London for last week’s opener as I was at camp in Sheffield but I watched it and it got the butterflies going again. It was a really good performance to take the win as China are a very strong team, so it was good to get off to a winning start. Brown believes he is a more competent fighter having made the switch from the middleweight division and is keen to prove that is the case. However, the ring was not a happy place of work for Brown last year having been overlooked by Team Scotland for the 75kg berth for the Commonwealth Games, a decision that caught most off guard. Springhill’s Kieran Smith was awarded the spot, despite an appeal being lodged by Brown, and he was eliminated from the competition at the first time of asking. “I was keen to see the back of 2014, but I just want to move on from what happened,” Brown admitted. “I know what I am capable of and, irrespective if I made the Commonwealth Games or not, I was always looking to push towards Rio. “Everything else is history and it was difficult, I’m not going to lie. But I am an experienced athlete and have had other disappointments in my career, so you’ve just got to move on. Boxing is a selfish sport, so there’s no point sitting dwelling on things. You’ve got to look at the bigger picture. Outside the ring, though, life got a whole lot rosier with the arrival of his first child, fiancée Linzi giving birth to their baby daughter, Monroe. 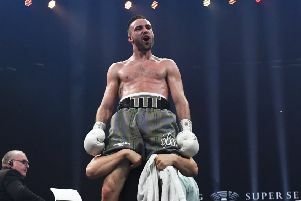 And although he wasn’t able to pull on the vest of Scotland and experience the vibrancy of a nation that stood with bated breath, his elation for new Commonwealth 64kg champion and club-mate, Josh Taylor, couldn’t have been more enriching. “To be honest, it wasn’t a big deal to me because on the day the team was announced, my daughter was born, so that flew over my head and I was a happy man,” he said.